A town of Russia, in the government of Vitebsk, 150 m. N.W. from the town of Vitebsk and on the railway between St Petersburg and Warsaw. Its population increased from 7306 in 1867 to 10,681 in 1897; but its importance is mainly historical. The cathedral is a modern building (1846). Ryezhitsa, or, as it is called in the Livonian chronicles, Roziten, was founded in 1285 by the Teutonic Knights to keep in subjection the Lithuanians and Letts. The castle was continually the object of hostile attacks. In 1561 the Teutonic Knights gave it in pawn to Poland, and, though it was captured by the Russians in 1567 and 1577, and had its fortifications dismantled by the Swedes during the war of 1656-60, it continued Polish till 1773, when White Russia was united with the Russian empire. A Latgalian hill fort is known to have existed at Rēzekne from the 9th to the 13th centuries, until its destruction at the hands of German crusaders of the Livonian Order. In 1285, the knights built a stone fortress on the site, which is today known as Rēzekne castle ruins, to serve as a border post on their eastern frontier. The name Rēzekne was first documented in 1285. Throughout its early history, Rēzekne was attacked many times by Russian and Lithuanian forces. The town became part of the Polish-Lithuanian Commonwealth after the Peace of Jam Zapolski in 1582 during the Livonian War. Rēzekne received Magdeburg rights from Poland in the 17th century, but fell to the Russian Empire during the Partitions of Poland. In 1773, Rēzekne received city rights. During the 19th century, the arrival of the Moscow-Riga and Saint Petersburg-Warsaw railways transformed Rēzekne from a sleepy country town into an important city with two stations. In the spring of 1917, the first congress of Latgalia was held in Rēzekne, in which Latgale decided to unite with the rest of Latvia. Following Latvia's declaration of independence in 1918, and the driving out of both the German and Red armies from Latvia, the city became a cultural centre for all of Latgale. Rēzekne was heavily damaged by both Nazi and Soviet armies during World War II; after heavy air-bombing by Soviet forces in 1944, 2/3 of its original buildings were completely destroyed. Out of a pre-war population of 13,300, only 5,000 people remained in the city at the end of the war. Rēzekne was rebuilt after the war with an emphasis on industrial development. Rēzekne had the 5th highest industrial output in the Latvian SSR, including a dairy processor, lumber mill, and electric-instrument factory. During this time, many Russians moved to the city, making up a large part of the population (48.5% in 2007). Click Here to see photos of the prisoner of war marches, the entry of the Red Army, the devestation and anguish of war. In German it was called Rositten. In Russian and Yiddish it was called Rezhitsa. In Latvian it is called Rezekne (Rez' ik na), the "city of seven hills." There was an old castle built there around 1260, over remains of one built perhaps in the 9th century. Legend says it was for Queen Ruzhina that the city is named. Jews have been there since the end of the 18th century. An 1802 description says there were 26 Christian merchants, 3 Jewish merchants, and no skilled craftsmen. In 1815 there were 1072 Jews, 90% of the population. In 1835 there were no factories but there was one brewery. Then in 1836 the St. Petersburg-Warsaw highway was built through Rezekne. The town expanded. Economic activity increased with the St. Petersburg-Warsaw railroad in 1861. Later the Moscow-Riga railroad also crossed there. There was a comprehensive census in 1897 of Russian towns. In Rezekne there were 1081 craftsmen, with 403 small merchant shops. There were two orthodox churches, two prayer houses (older form of Russian Orthodox), and ten synagogues. Of the 10,795 people, 6478 were Jews (60%). A 1906 description says there were two orthodox churches, one Catholic church, one Lutheran church, two prayer houses, eight synagogues, eight factories, two libraries, and one small hospital. 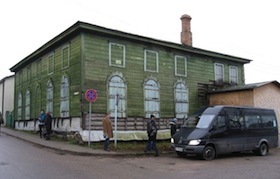 Only one synagogue, called the "Green Synagogue," survived the war and although condemned, there are some efforts to restore it. 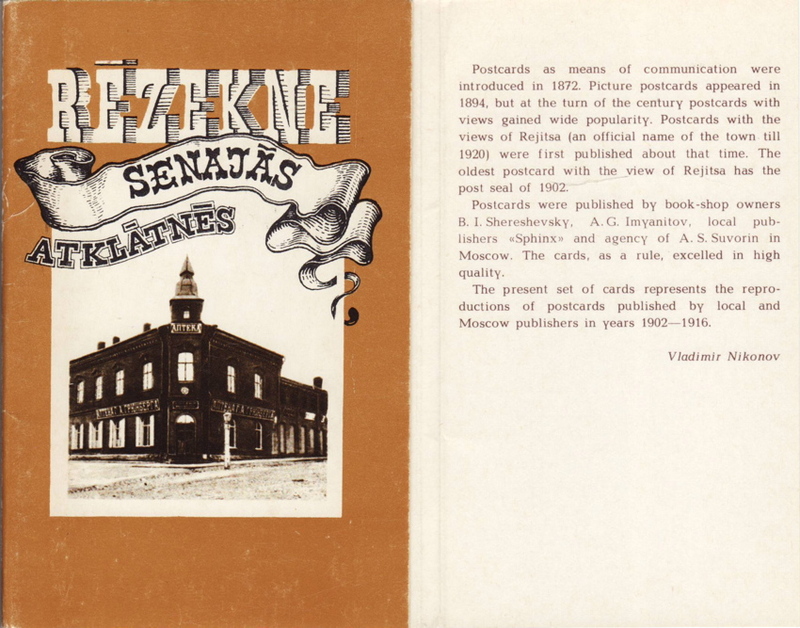 During the first independence between the wars, Rezekne became a cultural and economic center. Building development increased significantly. It became a beautiful city surrounded by gardens, with the river running through town, nearby lakes and forests. It was a vacation resort for people who didn't want to travel to the beaches in Riga. Before World War II, Rezekne was one of the most important Jewish communities in Latvia; over 50% of the people there were Jewish. Then the Germans came, and in one day in 1941, killed 5000 Jews. But Rezekne is a large town with railway lines close to the Russian border, and German occupation made the Russians nervous. In April 1944 the Soviet Air Force bombed the town. Fleeing Germans blew up many buildings. Over 80% of the city was damaged in the war, one of the most heavily destroyed towns in all of Latvia. Only 5000 inhabitants (of close to 13,400) survived. Today there are about 36,600 people, mostly Russians or Catholic Latvians, about 50 Jews. Rezekne, Daugavpils, Ludza, Kraslava, and some other shtetls in Latgale became centers of settlements for Jewish artisans and traders. The czars tried to keep the Jews apart from the main Russian population by restricting them to the Pale. But even within the Pale they could not buy land or engage in certain professions. A popular character in 19th century Latvian literature was the traveling Jewish peddler, who would visit farmsteads with his bundles. Jewish artisans, especially tailors, were welcome in Latvian farms. Jews believed linen cloth and wool cloth could not be mixed, so there were many tailors. The Cilevics were a family of itinerant tailors. 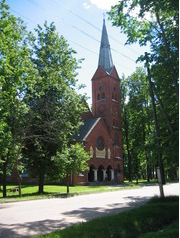 Due to Rēzekne's multi-ethnic character throughout the centuries, many religious communities have settled in the city. Ethnic differences were often distinguished on religious lines; the Germans brought Christianity to Latvia in the 13th century, as well as Lutheranism during the Reformation Period. The Polish influence over Latgalia in the 17th and 18th centuries strengthened Catholicism among the native Latgalians. 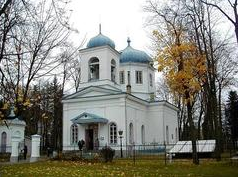 Incoming populations of Russian Old Believers introduced Russian Orthodoxy, and up to the 1940s, Rēzekne had a very large Jewish population, and therefore, many synagogues. The Catholic Cathedral "Vissvt Jzus Sirds" (Sacred Heart of Jesus), (built 1893-1914) dominates Rēzekne's skyline looking from the castle hill. "Vissvt Jzus Sirds" was built on the foundations of an older wooden church, dating from the 17th century, that burned down. The other Catholic church, "Spju Dievmte" (Our Lady of Sorrows) is much newer, built from 1935-1939. Other churches include the Old Believers "Svt Nikolaja" (St. Nicholas), Russian Orthodox "Vissvtks Dievdzemdtjas piedzimanas", Lutheran "Svts Trsvienbas" (Holy Trinity), as well as a Baptist church. The Cathedral was consecrated in 1901. It was built on the site of a previous wooden church which had been constructed from the funds alloted by Krakw military leader Belinskis. In 1887 the church was destroyed in the thunderstrom-caused fire. While attending the cathedral it worth paying attention to the curved wooden altars decorated by the sculptures of Jesus Christ, Virgin Mary, St.Teresa and others. The cathedral is famous for its depictions in stained glasses of first Livonian bishops -St.Maynard and St.Albert. 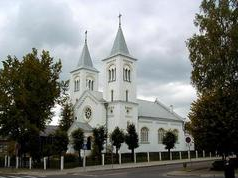 Since 1995 it is the centre of Rezekne-Aglona diocese with the seat of the bishop. Construction of the church began in 1936 (architect Pavlov). The 27 metres (89 feet) tall building was built in neo-romantic style. The church was consecrated on 6 December 1937, but the construction was finished only in 1939. Next to the church the sculpture of Virgin Ftima is located. It should be mentioned that many buildings in the city such as the Nation Palace of Latvian Society (the Culture House nowadays), the building of 6-classes elementary school (Secondary School no.3) and Red Cross Hospital (the students hostel nowadays) built in the 1930s were designed by Pavlov. Construction of the church dates back to 1840, though it wasn't consecrated until 1846. In 1854 was closed for reconstruction. After two-year reconstruction period the church got its modern look. Tile stoves, tiled floors, three-storey iconostasis and granite stoop decorated the church. A small stone chapel in memory of Alexander II rescue from death is situated on the left side of the church entrance. On the right there is a glass burial vault where the patron of the church, owner of the Adamova manor, General Karaulov and his wife Helen were buried. The church from red bricks was built in the 1930s. The church was designed by the architect J.Cirulis in neo gothic style. The church was consecrated in 1938. In the summer of 1949 the Soviet authority deprived the parishioners of their church, removed its crosses and dismantled the belfry. For many years there was a rent a film company. The parish got back its property at the beginning of the 1990s and the building has undergone capital repairs (the church was reconstructed). 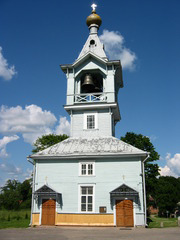 There is an opportunity to climb the bell tower and see the Rezekne from the height of 37 metres (121 feet). The concerts of classic music and divine services take place in the church nowadays. The church was built in 1895, but in 1906 it was remarkably rebuilt erecting the belfry with 3 bells and as a result the building got its modern outlook. The church is famous of its bells. One of them weighs 4,832 kg (10,653 lb) and it is the biggest bell in Latvia. The bell clapper alone is 200 kg (441 lb) heavy. The museum is now opened in the premises of Rezekne Old-Believers Cemetery Commune and it reveals the daily routine and lifestyle of Latgalian old-believers. In one of the rooms the collected items reflect the church life; another has etnographical staff in it. The museum can be visited on request.